boys and girls… after one of the most successful years in the history of the club and a short but fun break it’s time to launch officially the new Season 2016/2017. 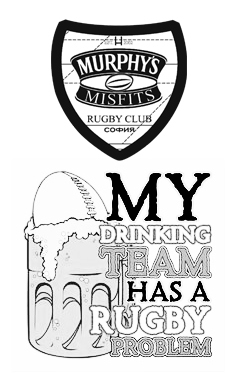 As a small hint for what to expect we want to share with you the Misfits motto for the new season – “My drinking team has a rugby problem!”. After the most recent issues around CSKA Sofia there is still a lot of uncertainty around the CSKA Sports Complex in Borisova Gradina. We were unable to book the pitch there for the new season and that’s why we have to move to a new place. Luckily, we were able to find another great artificial pitch with brand new facilities in the city center – “Sportna Sofia – 2000” in Zona B5. Click HERE to see the exact location. ** UPDATE: As of 8th, October 2016 we are back to CSKA Sports Complex in Borisova Gradina. We will keep the flat rate. A participation in a touch rugby practice or a weekly training will cost you 5 lv. Kids and students are free of charge. The committee appointed Nencho Neikov as the new Steward of the club. That means Nencho will take care of collecting the fees, handling the communication of the facilities manager and storing the equipment. Let’s wish him luck! Touch rugby practices starting time moves back to 12:00h each Saturday. Please, be around the pitch 11:30 in order to prepare, as we cannot postpone or prolong the practices. We begin again with the regular weekly training – 20:00h each Thursday. Make sure you get to the pitch around 19:30h to prepare. Izzo is a well known player in our community. He has more than 15 years of experience, playing rugby in Bulgaria, the UK and Germany. He will help Kaloyan in the coaching work, sharing his vast rugby knowledge and progressive vision. Let’s welcome him in this new role! In general we intend to play regular touch and contact rugby, to train and learn new skills and develop as a team, to watch our favorite teams play and drink a lot of beers. Not a surprise! Rejoice and don’t forget – Rugby is the Source!